Executive Director Craig Lewis sat on a panel at this event, which took place on February 13, 2018 in San Francisco, CA. The Clean Coalition was a partner organization for the Germany California Energy Storage Symposium, which took place on February 13, 2018 in San Francisco, CA. Executive Director Craig Lewis sat on a panel with storage integrators and utility representatives to discuss the Clean Coalition’s Community Microgrid Initiative and its innovative approach and methodology. The German American Chamber of Commerce presented this exclusive knowledge exchange between U.S. and German experts in the energy storage field and a unique opportunity to hear from high-level speakers and meet with companies from both countries. The full-day symposium focused on different approaches on both sides of the Atlantic and includes presentations from German and American energy storage experts. Attendees of the conference learned about the latest developments in the energy storage sector and met with German companies to discuss potential synergies. 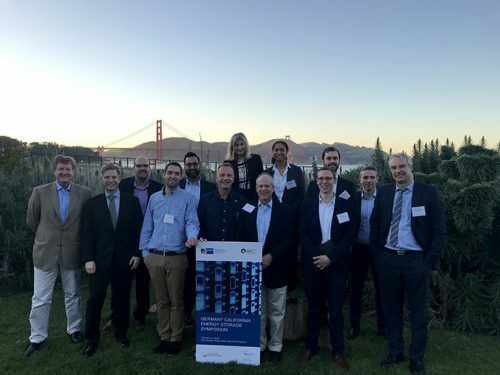 The Germany California Energy Storage Symposium was part of a delegation trip for selected German companies and energy storage experts who visited California from February 12-16, 2018. The program aims to strengthen innovation transfer and collaboration between German and American energy storage stakeholders. The German delegation met with local industry leaders, research institutions, and government representatives to exchange ideas, discuss new developments and lay the groundwork for future cooperation.